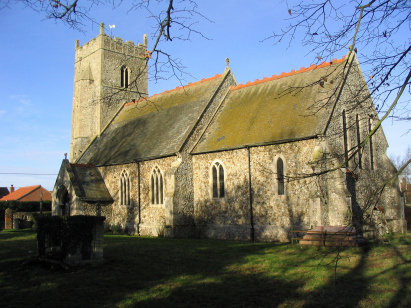 The parish of Boughton lies in West Norfolk, one of a series of parishes close to the line of the A134 road which runs from King's Lynn to Thetford and along the edge of the Fens. The road likes to keep its feet dry and the villages are no exception being 20 metres or so above the Fen level and on dryer agricultural ground. Boughton village is set about a mile north of the A134 and about 5 miles east of the market town of Downham Market. It is a compact village with houses gathered tightly around the picturesque village green and pond. All Saints church lies just north of the village centre, accessed by a short lane. The only original feature of the building is the western tower which appears to be of an age with most Norfolk churches e.g. the 13th or 14th Century. The main body of the church was completely rebuilt in 1872 and is rather cruelly described by Pevsner as "hardly inspired". A sad comment on what to my eye is a pleasant village church. A single standard 800-entry register book covers the period of the transcript and continues up to modern times. The book has suffered some damage through the years and is stained with water & mould damage in places. The register has been filmed recently on microfilm MFRO698 which is a modern era film with all the benefits according in terms of clarity and contrast. The images are sufficient to read despite the damage to the original and as a result this was a straightforward transcript to prepare and it is to be hoped few errors will have crept in.